Ever thought of designing your dream home? You must have imagined a gorgeous poolside patio, sleek and modern fittings and furniture or a stunning rustic, dreamy country side environment. And of course who can forget about creating a wonderful get away from home inside your dream home? While some people would like to invest in building and decorating a beautiful pool or garden to spend their evenings outside, others may want an indoor escape to enjoy a relaxing weekend. 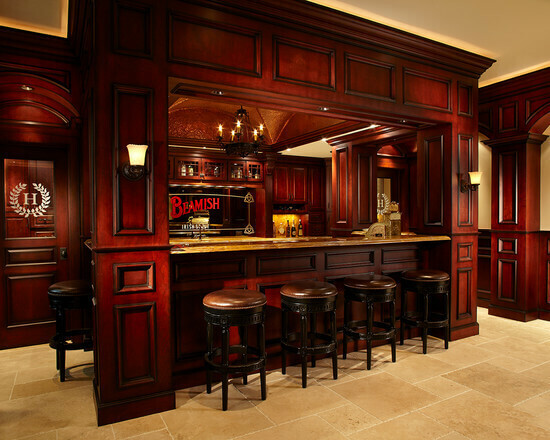 A stylish home bar in the basement of your house will be the perfect place for the men in your family to have their fun right in the comfort of your home! Building your own home bar may seem like a dream come true, but often the cost and space are the biggest hindrances. But don’t worry! There are so many homeowners who have transformed their small basements into bars through the simplest of solutions. 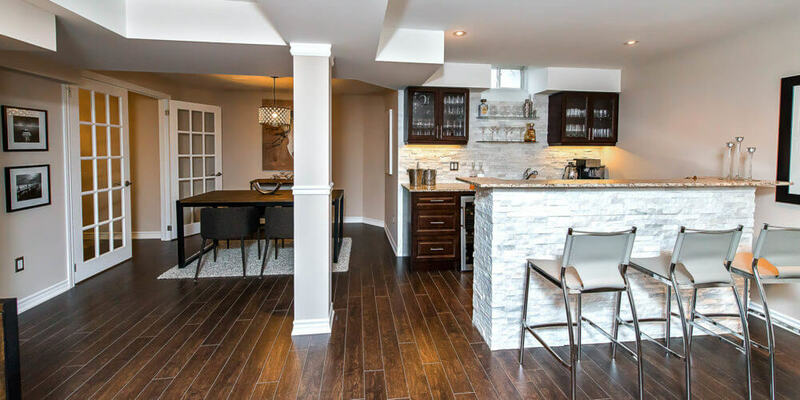 Whether you want to build an extravagant bar for yourself or stick to a simple economic option for a small space, you no longer need to think and plan ahead for years to renovate basement. Entertain your guest in style by installing your very own personal bar! Transforming your basement into the perfect bar to serve drinks will not take up too much space and can be constructed using industrial-style plywood and will not affect your pocket too much! You can also add a DIY unique wine rack and beer tap. Some more ideas for the open bar are:· Dark wood can instill an air of stylish elegance in the bar and living space.· Experiment with contrasting colors: For a modern look, you can experiment with traditional design elements; for example, you can use hardwood in one half of the area and use a contrasting color such as red or orange in the other.· Use wall art: Wall art can give a fun modern look to the bar.· Install chandeliers: If your budget allows, you can use lighting fixtures such as chandeliers to add some sparkle and lighten up the basement.· Add silver: A slick silver bar can give a sleek, spacious look to the basement. If you are not a fan of monochromes, you can add colorful paintings and use bright pops of contrasting color.· Paint it red. Red walls will exhibit an air of luxury and sophistication, particularly combined with dark wood. · Build keg stools: An array of kegs can be used as stools and instill an element of fun in your basement bar. · Use stones in the bar: A wood planked ceiling and walls with a stone bar can give it a rustic feel. · The classic single-wall wet bar. Install an under-mount sink, light or darkwood recessed shelfs, with a marble counter and maybe even a mirror can transform the smallest space into your dream bar. · Add cabinets: You can install different colored cabinets above and below the sink to create the illusion of space. · Storage for glasses: If you cannot install cabinets, a good idea is to make some space above the sink for glasses in the middle of the bar, in the form of a shelf or an upside rack. · Transitional single-wall wet bar: The entire bar can be stacked behind a transitional door to save on space. · Back-wall wet bar. The back stone or brick wall of your basement can serve as a mountain style backdrop of your wet bar with steel or wood cabinets and dark-wood floors. · Minimalist single-wall wet bar. Flat panel cabinets, white or mirrored décor with glass shelves will give a modern minimalistic look to the bar. This is probably the most popular layout amongst nostalgic homeowners who are looking to convert their basements into their favorite bars. Even without ample space, the traditional lights, brick or stone walls, iron fixtures can be installed to give your bar the pub feel. You can create the right mood with a themed background, neon lighting and rustic furniture, whether you want a British pub or a classic American bar! You can transform your basement into a bar and a hangout for fun, games and parties! You can easily include living area next to your bar if you like relaxing. Or, you can add an entertainment center for the whole family to enjoy! A small dining space for two can serve as the perfect romantic getaway. For games, you can add a pool table, foosball and single seaters for a party with friends and family over the weekends. Using the right colors such as pastels and white can enlarge an even small space and illuminate the entire basement when accompanied with smart lighting. If you are a wine enthusiast, a basement is the perfect storage place for it. A basement is naturally cool and provides an ideal environment for storing your expensive wine. And it definitely taste great whenever you pop a bottle! A bar or wine cellar is a brilliant addition to your basement bar if you have the requisite space. Even with less space, you can dedicate one corner or wall to a wine storage area. You can either build one yourself or hire a Cap-Able Group to design and build a bar according to the theme of your choice. · Temperature control. A specific wine room cooling and refrigeration system is essential if you are considering turning your basement into a wine cellar. Of course, this is only possible if you have the budget for it. · Insulation. Alternatively, you can strive to insulate your wine cellar if you can’t afford to install a temperature control system. This will entirely depend on where you are located; for the south of America, for example, experts suggest installing a moisture barrier outside every wall of the basement, along with the floor and ceiling to prevent molding. · Utilize available space. You don’t need to use the entire basement area for wine storage if you don’t want to. Consider using a closet space or small storage area to create a wine cellar in one corner of the room. · Use stainless steel racks for wine bottles. This will prevent airborne contaminants. · If you are using wood, choose a quality with a natural finish. Choose a wood that requires only a mineral oil finish, such as mahogany or walnut. · Use all the vertical space available. You can install cabinets that are vertical and make use of walls, even the space under the staircase can be converted into a mini-bar. · Cut the corners. Using the corners to create an L-shaped bar can be a revelation for any bar enthusiast. · Look under the stairs. The perfect way to make maximum use of a small area is to install a bar or cabinets under the staircase. · Install extra compartments. This can give you more space to store glasses and drink bottles. · Convert an old closet into a bar. You can custom build a bar into a closet area to save space in the seating area. · Create a cart bar on wheels. You can use an old cart and stock it up for use. Wheel it out of the way when you are done! · Folding kitchenette. This idea can be used for a small spaced basement bar set up successfully. Getting started: how can you turn your basement into a bar? · Firstly, and most importantly, decide where the bar should be. You can opt for a bar in the center or on one of the walls. All you have to do it get (or build) a counter and some bar stools and you are done with the first part! · Decide on the storage space. This part is a little trickier. You can save on so much space with a compact bar with built-in wine coolers and cabinets for storage. · Design your bar to be multi-functional. One very easy tip is to look at the layout of your kitchen and replicate it. But the bar will be much simpler because you don’t need a stove or oven for cooking. You can design your bar like a kitchen island with drawers and storage cabinets. For a more professional look add a sink and display shelves for glasses. If your budget allows, you can even add a nice wine rack. · Collect your memorabilia. Every house has some posters and other memorabilia lying around for nostalgic reasons. You can hang up posters, signs and pictures to give your bar a hip, modern vibe. · Use warm wood hues with white. The color white bring an element of illumination and can work particularly well for a basement with dark colored furniture and paneling. A good idea is to paint the walls and cabinets white and install a dark wood bar counter with the same hued bar chairs. · Custom pull out drawers. These are especially useful when you are challenged for space in your basement bar. Drawers can hold bottles and glasses and save space. · Under the shelf lighting. Installing lights under the shelf spaces can give a modern and inviting appeal to your bar, brighten the area and show off your creative prowess. · Light colored stone surfaces. Light colored stone will give your bar a bright, rustic and chic look. Use it on the bar top and the surrounding walls to illuminate the entire basement. How much does a basement bar renovation cost? If you are not every enthusiastic about DIY initiatives, you can easily hire a Cap-Able Group to do all the work for you. The best part is that a competitive market allows for lower rates than a few years before so you don’t have to splurge extensively in order to convert your basement into a bar. There are so many companies that strive to provide a hassle free experience for their clients; they will also typically include all labor and material costs and a clean-up of the area after completion so you can be at ease. While actual costs will totally depend on the materials being used and the amount of renovation and restructuring required, you can get a free of cost examination and appraisal of the entire process at your own convenience. Typically renovations will cost about $50 to $100 per square foot varying on the clients own preferences. But, again, remember that each basement is different and has its own unique requirements as per the homeowner’s personal tastes and preferences. Whatever your preferences, these unique design ideas along with the above tips and tricks can help you on your way to transform even the smallest spaces into your dream basement bar, even if you are on a budget!